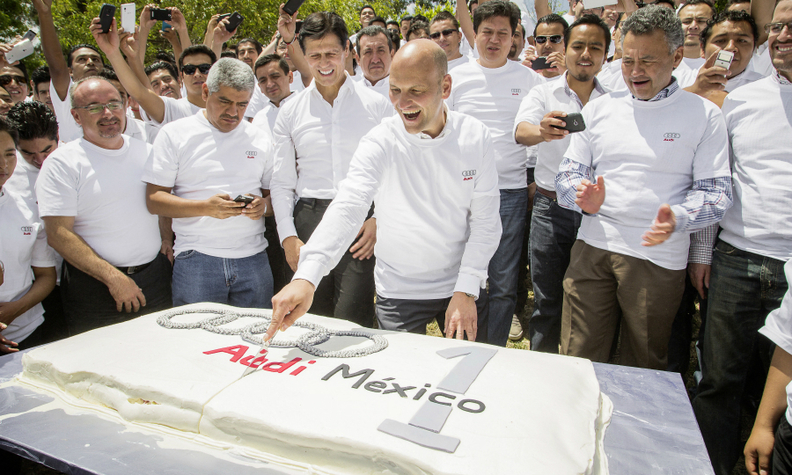 Rust cuts a cake in 2014 to mark the Mexico plant's first year of construction. Audi has replaced Mattias Rust, the human resources chief at its new Mexico factory, shortly before the plant's opening, German media reports said. Rust was replaced because of "irregularities," the reports said. An Audi spokesman confirmed Rust's removal from the post to Automobilwoche, a sister publication of Automotive News Europe. The spokesman declined to say why Rust had left his post, citing legal grounds. Rust has been replaced on an interim basis by Cornelia Kaiser, Automobilwoche reported. Kaiser was previously Audi's personnel manager in Mexico. Audi will open the plant in San Jose Chiapa in central Mexico on Sept. 30. The factory will build up to 150,000 units of the Q5 midsize SUV annually for global markets including the U.S and Europe. Audi also plans to produce an electric version of the Q5 in Mexico, Reuters reported in June, citing sources with knowledge of the project. Audi picked San Jose Chiapa for the plant because it is near parent Volkswagen Group's existing manufacturing operations in Puebla.